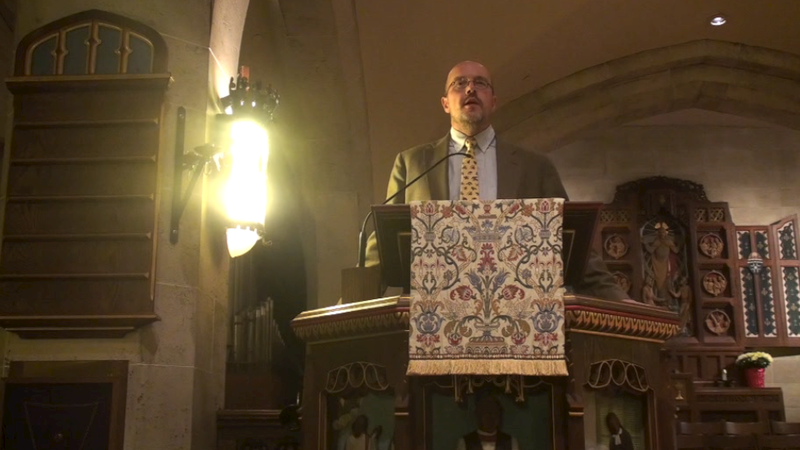 Two weeks ago I gave a talk to my school about a few of my reflections on my sabbatical year in Israel and Palestine. It was given in the context of a the Episcopal service of evening prayer, which my school holds every Wednesday after a community meal. For the readings I selected Psalm 122 and Isaiah 2:1-4. For the hymn we sang “This Is My Song.” In my talk I refer to several previous talks given this year: a Convocation address by Elizabeth Roach, chair of the English Department and chapel talks by Tad Roach, Head of School and Will Speers, Associate Head of School. When thinking about where to go for sabbatical, the four members of my family had different needs. I wanted adventure. My wife Hilary wanted safety, and urban life and good pediatric health care. Hannah wanted a school where her teachers would speak English. And Margaret, at the time just turning three, ask “Do I go too? Is there food there? May I eat it?” Eventually we settled on Jerusalem, which was adventurous, safe, urban, with great health care, a terrific school for the girls, and food Margaret could eat. By the way, we did decide, after a family meeting, to take Margaret with us. Last year I sat down for individual interviews with thirty Palestinian and Israeli religion teachers. During my talk this evening you will hear some of their voices. Some will be Jewish, some Muslim, some Christian. Some will be secular, others observant. Some you may agree with, and others you may strongly disagree with. In between their thoughts, I will try to describe some of the hopes and frustrations I experienced in Jerusalem. If I came away from Jerusalem with one overriding sense, it was that we must work incredibly hard to understand the deep commitments held by those who differ most from us. Hannah, Margaret, Hilary and I walk east down a street in Jerusalem. At a certain point, all the shop signs and the conversations around us change from Hebrew to Arabic. Where further up the street we had passed a synagogue, now we pass a mosque. We notice a pair of Israeli soldiers, while further up the street we would have seen only a police officer. Painted on the walls are pictures of the Dome of the Rock, the holiest spot for Muslims in Jerusalem, in the red and green colors of Palestine. Up the block there were the light blue and white Israeli flags flying, the Star of David visible everywhere. Here is more trash in the street, the sidewalks are more crowded, and the buildings are in worse repair than just a brief walk to the west. What changed so radically in my family’s short stroll down a street heading from west to east? On our walk, my family and I had crossed an invisible line, one that until 45 years ago was the cease-fire line between Israel and the surrounding Arab states. This walk was peaceful; there was no risk of Israelis and Palestinians erupting into clashes, and I was never worried for the safety of my family. Jerusalem is a safe place. Peace, however, is not the same as justice, or a sense of long-term security. To the Israelis living up the street, there is a powerful sense of living near, next to, on top of an enemy that at times has sworn to drive them into the sea, to kill them. Memories of the Holocaust, of millions of Jews being killed and millions more being displaced, are never far from the surface. Though the horror was committed by a different people in a different place and time, many Israelis cannot help but see the shadow of the Nazis in the hateful statements of Hamas or other Palestinian groups. To the Palestinians in the neighborhood we had just entered, there are the thousand burdens of occupation. They risk being forced out of their homes. Getting good work is difficult, especially since they are unable to travel around the country without special permits. The school system is underfunded, as are other social services. To my eyes, evidence of Palestinian loss abounds. Jerusalem in 2012 is a city at peace, but that does not mean it is a peaceful city. I was immensely frustrated by the inequities I encountered, for two reasons. First, they are completely human-made. The first thing most people will say about the Israeli-Palestinian conflict is “it is complicated.” I disagree. Without the extremists on both sides acting as spoilers, the outlines of a relatively fair political settlement are clear, and have been clear for decades. Second, life in Jerusalem is getting more and more unfair. In the United States, for all our failings, the arc of domestic human rights in my lifetime has advanced from Martin Luther King to the womens’ rights movement to the gay rights movement. In Jerusalem and in all of the occupied territories, it is the opposite. Palestinians have been losing houses, employment, and rights of movement throughout this same stretch of time. The tragedy of Jerusalem is the inability to listen, and not simply to listen to the debating points of the other side in order to refute them. Many on each side fail to appreciate the deep feelings beneath the arguments. These two people, the Israelis and the Palestinians, claim the city as their own. I sought to soak myself in the stories each had to tell, stories filled with sacred joy, with moments of triumph and beauty, with instances of deep connection. I attended and nodded as I was told stories resonant with visceral suffering, with sadness and longing, with powerful experiences of loss. Sometimes my conversationalists would erupt in anger. Occasionally I would be the one to feel anger, as when a Jewish teacher repeated the claim that most Palestinians had only been in the land 100 years, or when a Palestinian artist joked lightly about his dad having built bombs. In her Convocation address, Mrs. Roach encouraged us “to resist defensiveness, closed-mindedness, and competition, to practice using a tone that invites conversation, thought and reflection. In these moments, we cannot hide from each other; we are open, vulnerable, exposed, to an extent; they are moments that we cannot fully control but rather moments in which we need to be fully present and open and real, moments that may lead to new ideas and new understandings about ourselves and the world around us.” How do Israeli and Palestinian teachers open themselves up to each other in these ways? In my interviews I asked each teacher why, of all the paths open to them, did they choose to become teachers? Why specifically did they end up teaching about religion? What did they most hope their students took away from their studies? I also wanted to know how I as a teacher could teach more effectively about those people very different from my students and from me. Encouragingly, I also met both Palestinian and Israeli teachers who sought, often without much support from their schools, to communicate an understanding of the other. They could express the holiness of Jerusalem for themselves and for others, a holiness you heard Mr. Speers evoke so beautifully. Whether it is a Jew placing a written prayer in the Western Wall, a Muslim standing shoulder to shoulder with other believers and prostrating at the al-Aqsa mosque, or a Christian kneeling to kiss the stone that held Jesus’ cross, Jerusalem holds almost too much meaning for too many people. As Mr. Speers’ wondered about the Western Wall, “How could a barren, undecorated, lifeless wall be so intimate, nourish such a communion, touch me back?” I often felt relief and comfort when I spoke with the Muslim, Christian and Jewish teachers who make room to listen to this feeling of connection not just within themselves, but within their neighbors. I also admired those teachers who sought to ask themselves difficult questions about their own histories, beliefs and actions. Mr. Roach modeled this for us in our first St. Anne’s chapel when he simultaneously celebrated the history of the church and yet acknowledged, “As beautiful as this church is, I always remind myself that ‘good Christian people’ (Flannery O’Connor’s phrase) worshipped and prayed here and accepted a balcony section reserved for slaves. Such congregations once gathered secure in their beliefs that they were following God’s word; they simply did not allow the words of the service to awaken them to the depravity of racism.” Again, we come back to Mrs. Roach’s call to us to listen, in this case to think critically about our own tradition. [#12] A Palestinian Muslim: I don’t teach in an extreme way. For example in Islam, we are not supposed to listen to music, OK? So when my students ask me what about music? I say, no we can listen to music. I myself listen to music, but we have to choose what kind of music to listen to. Because of globalization and because of the use of internet and um Facebook and computers, now it’s an open world. We don’t have to be extreme. [#13] A secular Jew: When I introduce a reading from just one perspective, the students now object, “but this is the Jewish point of view. We are not religious, we want to see other points of view. We understand we are living in the Jewish culture and we want to know about it, but can we learn something else? Something that we can decide to live by?” And it became very clear that they want to meet as many options as possible. Many times in our year of walking around Jerusalem, and Tel Aviv, and Ramallah, and the Galilee, and the desert, Hannah and Margaret would encounter something that made them say, “That’s not fair.” Usually it was the way the Palestinians were being treated under occupation, though sometimes it was the history of the Jewish people. Of course, a reflexive sense of fairness does not necessarily lead to an open appreciation for the others’ hopes and fears. It can be, however, a beginning. How do we seek to make the world more fair? I feel even more strongly now than when I departed for Jerusalem that we must acknowledge the importance of knowing ourselves, our history, and our beliefs. We then push beyond that to making a deep connection to knowing others, their history, and their beliefs. We need not come to believe what they believe, but we should seek to have a rich understanding of how they came to be who they are. I am incredibly grateful to Mr. Roach and Mr. Speers, to St. Andrew’s School, to the Fulbright Fund, and especially to my wife Hilary for giving me this amazing opportunity. I am also appreciative of the work of all those across the world fighting for the right of peoples to live justly in multiethnic states. I pray, not just for the peace of Jerusalem, but also for a deep mutual understanding in Jerusalem, an understanding that leads to justice.